MOIECIU, Romania — Even before last weekend, Center Conway’s Sean Doherty had already had a phenomenal biathlon season, finishing as high as 17th place in a race in the men’s World Cup circuit, where he is competing as part of the U.S. Biathlon men’s team. The 20-year-old Doherty took a break from the men’s circuit to compete in his final year of eligibility at the Junior World Championships, which wrapped up Sunday at the Cheile Gradistei ski area in Romania. Doherty made the best of the trip. On Saturday, he became the most decorated junior biathlete in the history of the sport, winning the ninth medal of his junior career and his second at this year’s world championships. The race, a 10-kilometer sprint, saw him finishing second to Austria’s Felix Leitner. Doherty’s silver medal came on the heels of his bronze the day before in the 15k individual race. This set the stage for Sunday’s 12.5k Pursuit race, where Doherty started in second place, 12 seconds after Leitner. Doherty would be going for an unprecedented 10th junior medal. Starting so close to the leader, did it have an impact on his race day strategy? Doherty stuck to his plan, staying within 10 seconds of Leitner for the first lap as they headed into the first of four shooting stages. 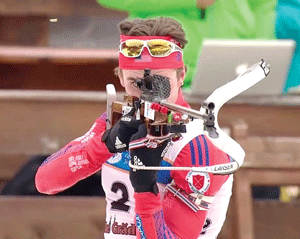 In biathlon, each stage of shooting consists of five targets. Each missed target in a pursuit race results in an additional penalty loop of 150 meters of additional skiing. A bad day of shooting can result in a time penalty from which even the best skier cannot recover. Both Leitner and Sean shot clean in the first stage, hitting all five targets. Doherty gained more ground on the second lap, and both skiers headed into the shooting range for the second stage almost together. Doherty missed a single shot, while Leitner again shot clean. This gave him a lead of 21 seconds heading into the third lap of skiing. Working to regain ground, Doherty knew it would be critical for him to shoot well. Leitner missed two shots in the third stage, giving the Kennett High graduate the opportunity to capitalize. Doherty missed only a single shot, which meant he headed into the fourth lap in the lead. “My teammate shortly before the range told me, ‘Come on, Sean, show him some standing shooting,'” said Doherty. Doherty shot clean on the fourth trip to the range, with Leitner missing one shot. Doherty knew the race was his. “When I cleaned the final standing, I knew that I had the race locked up. The last lap was in its own way surreal.” he noted. Doherty won in a time of 36:01.1, waving an American flag that had been handed to him near the finish line. Leitner ended up finishing in third place, behind Russian Nikita Porshnev, who missed only a single shot over the four shooting stages. Similar sentiments were echoed by Max Cobb, president and CEO of the U.S. Biathlon board. “Sean’s performance this week has been tremendous, a clear demonstration of all his hard work and the support of his family friends and the team!” Cobb said. “He has established a trajectory in this, the most demanding endurance sport, that outshines some of the current World Cup stars with his record-breaking 10 medals as a youth (U19) and junior (U21). Doherty is back home in the Mount Washington Valley, getting some rest before joining the men’s World Cup circuit. His next race will take place at the Nordic Heritage Center in Presque Isle, the only U.S. stop on this year’s World Cup, and which will give New Englanders a chance to see the best in the world compete in four days of races. For fans interested in attending the event, the races take place Feb. 11-14 (biathlonmaine.com). Asked how it felt to be the most decorated athlete in junior biathlon history, Doherty shared his feelings but made sure to give thanks for all of the great support. For more information on the sport of biathlon, check out usbiathlon.org. For locals in the valley looking to try the sport or learn more, they can visit Jackson Biathlon at www.jacksonbiathlon.org. Most of the World Cup races are also webcast live at www.eurovisionsports.tv/ibu/, where you can cheer on Doherty most weeks between now and mid-March.